Eastman Kodak Co., Chicago, Illinois, U.S.A. 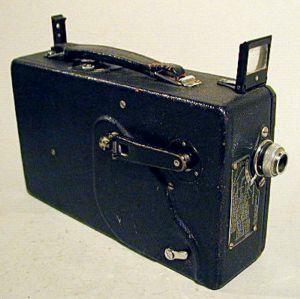 It is a very rare movie camera; produced in 1923, , it is equipped with a lens Kodak Anastigmat 1:3,3 - 25 mm. The camera weights kg. 3,300 (kg. 4 including the film) and its measures are the following: 117x201x300. The housing is in black metal. The camera is perfect. This camera must be operated on a tripod in order to crank it while shooting. 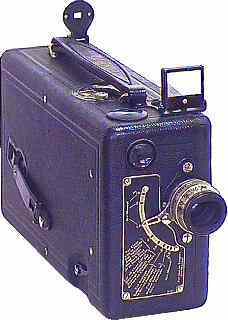 This is a very good movie camera, produced between 1923 and 1931. The original Model B was produced in 1925 (July, roughly, based on Kodak's advertising), with f/6.5 lens and no Newton finder.� The Newton finder was quickly added (first as a do-it-yourself kit, then to production).� The f/3.5 Model was introduced early in 1926 (approximately April). 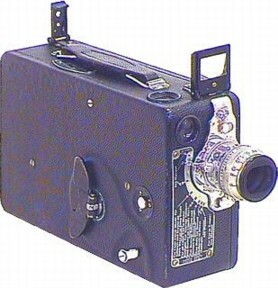 There was a second version that changed the shift mechanism for the closeup (from wheel to button) and changed the closeup range from 4-8 ft down to 2-5 ft. No dates available for the change, but probably a year or so later based on production numbers.� All f/6.5 and f/3.5 cameras were equipped with a 20mm lens. 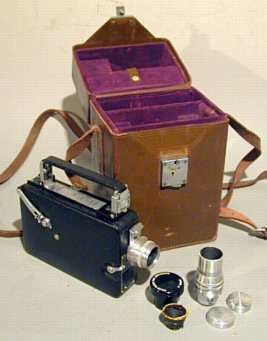 The third type was equipped with the 25mm f/1.9 lens, non-interchangeable; mid-1927. The fourth type added interchangeability to the lens; late 1928. There are some other sub-varieties, but mostly having to do with the colored models. My camera is the second type (1927). The camera, a 16mm, weights kg. 2,300 and its measures are the following: 70x126x243. Its body is a metal body covered in black leather. It works perfectly. At the origin the price was 150 dollars. 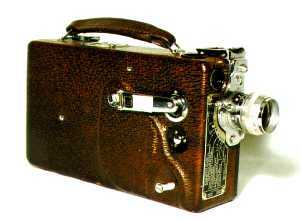 It is a rare movie camera; produced in 1934, it is equipped with a lens Kodak Anastigmat 1:1,9 - 25 mm. The camera weights kg. 1,300 and its measures are the following: 55x110x212. The viewfinder is separated from the handle.The housing is in metal, covered with black leather. The camera is perfect. This machine was produced in the period 1930-1946, and it is equipped with a lens Kodak Anastigmat 25mm f/1.9 - f/16. This machine is an upgrade od Model BB, but it has a lightly larger body to accomodate a 100ft magazine (the Model BB accomodated a 50ft magazine). The camera weights kg. 1,500 and its measures are the following: 55x117x220. The viewfinder is separated from the handle. The housing is in metal, covered with brown leather. The camera is perfect. 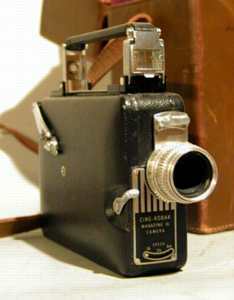 This machine was produced in the period 1933-1934, and it is equipped with a lens Kodak Anastigmat 1:3,5 da 20 mm. The camera weights kg. 1,500 and its measures are the following: 55x117x220. The viewfinder is separated from the handle. The housing is in metal, covered with black leather. The camera is perfect. 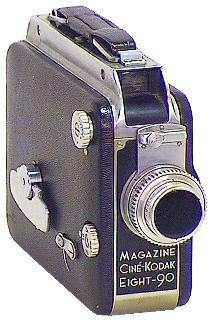 This machine was produced in 1932, and is equipped with a lens Kodak Anastigmat 1:3,5 12,5 mm. The camera weights kg. 1,050 and its measures are the following: 36x110x160. It is very light. 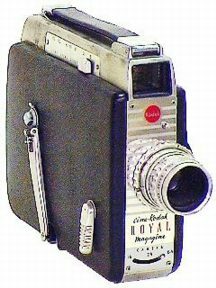 It was the first camera using rolls instead of cases.The housing is in metal, covered with black leather. This 16 mm movie camera was produced between 1936 and 1945. Is used 16mm magazins instead of spools. Inside the leather case there is a new Kodak magazin (expiring in 1954). The camera operates perfectly. The film could be exposed at 16, 32 or 64 frames per second, the viewfinder (it is built into the grip) was adjustable according to the used lens. The standard lens is a Kodak Anastigmat 25mm f/1.9-f/16; it could be exchanged with seven different focals lenghts between 15 and 152 mm. Inside the case there are a 15mm f/2,7 Anastigmat lens and a 4� 1/2 (about 115mm) f/4,5 Telephoto lens. 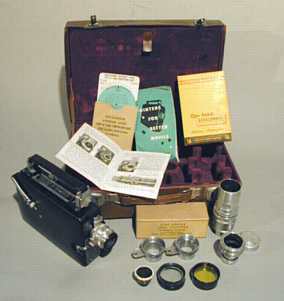 There are two adapters for the lenses; three filters; a guide-book for the exposition; a guide-book for the use of the lens and a folder for the amateur filmaker. The weigth of this camera is kg. 1,200, and its size is 46x105x185 cm. This is the new version of "Magazine Ciné-Kodak". It was intrduced in 1945 and produced until 1950. It used 16mm magazins. The camera is equipped with a lens Cine Ektar 25mm f/1.9 - f/22. In addition there is a Kodak Telephoto 76mm f 4,5. The weight is kg. 1,200, and its size is 46x105x185 cm. 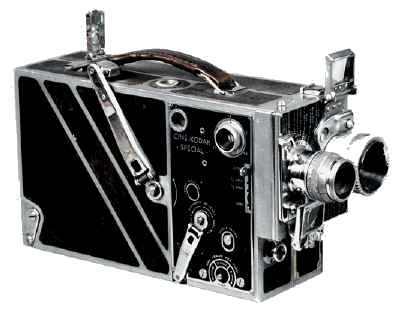 This excellent movie camera was introduced in 1951, in order to reach everyone. In fact, this camera is very simple and cheap. The model "II" was introduced in 1956 and was produced until 1958. 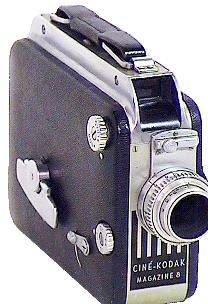 It used a 8mm film, and was equipped with a lens Ektanon 13mm f/2.3 - f/16. The diaphragm could be regulated by rotating a ferrule, indicating the weather conditions (sun, cloudy, etc.). The viewfinder had three squares (green, red and orange). It was possible to add optic devices to the lens. The weight is kg. 0,750, and its size is 57x95x157 cm. 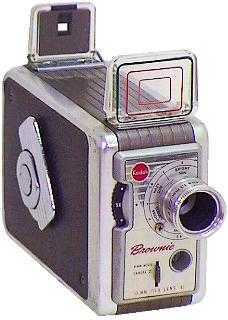 It's a good machine introduced in 1950, that was produced until 1967: infact it was a 16mm "for all". It was equipped with a lens Kodak Cine Ektar 25mm f/1,9. On the right size of the housing there is a ferrule to to adjust the viewfinder. The weight is kg. 1,200, and its size is 46x125x188; the housing is in metal, and covered with black leather. 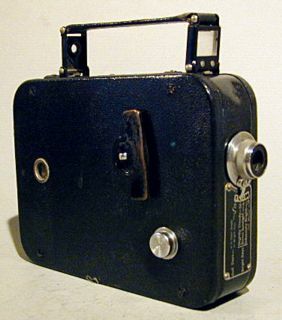 It is a movie camera introduced by Kodak in 1946, and was produced until 1955. The camera is equipped with a lens Kodak Anastigmatic 13mm f/1,9. The movie camera weights kg. 1,050, and the measures are the following 48x107x155; the body is metallic, covered by a black skinc. In 1946 the cost was 176 dollari. It is a quite small movie camera. It was introduced in 1950, and was produced until 1946. The camera is equipped with a lens Kodak Anastigmatic 13mm f/1,9. The movie camera weights kg. 1,100, and the measures are the following 48x107x155; the body is metallic, covered by a black skinc. In 1940 the cost was 98 dollari. 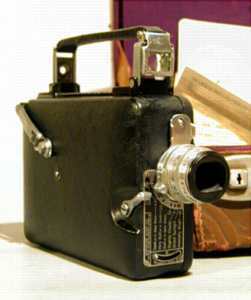 The Cine-Kodak Special II was produced in 1948 until 1961. It is equipped with two lenses: a Kodak Anastigmat 1:2,8/15mm and a KOdak Cine Ektar 1:1,4/25mm. The camera weights 4,200 kg. and its measure are the following: 72x127x275 mm. It is a 16mm camera with many of features enabling the operator to handle a wide variety of work beyond ordinary motion-picture photography. A warning bell announces when the spring is fully-wound, and again three-feet before the spring reaches the end of the run. 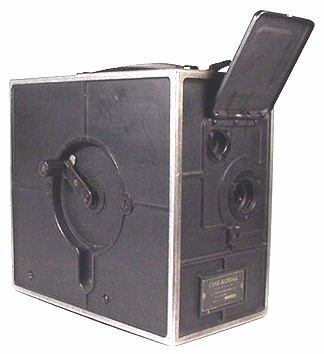 The camera body accepts film chambers of either 100 or 200 ft. capacity. The camera body has a frame counter indicating frames from 0 to 40. The camera has a two-lens turret which is placed to avoid optical interference when using wide-angle and long-focus lenses. The camera accepts a wide variety of lenses from 15mm to 152mm with Kodak mount. A reflex finder sighting through the taking lens shows a full-frame image for parallax-free framing, and for critical focus when working beyond lens scale or with extension tubes. To use the hand crank, the front running button must be held, or locked in running position, with other hand holding hand crank firmly. When winding the hand crank backward, the spring motor will wind.